Before I get to our fantastic interview with Jenna for my ASK THE EXPERT series, I just want to say that I hope you are all safe and getting your lives back to normal from Hurricane Sandy. And I hope you vote tomorrow. And now I have a few winners to announce. The winner of SAMANTHA SUTTON AND THE LABYRINTH OF LIES is MELODIE WRIGHT! And the winner of OF GIANTS AND ICE is JESSICA HAIGHT! Finally the winners of BLIND SPOT are EVIE and JESSIE! Congrats! E-mail me your addresses so I can send you your books. You must e-mail me by the end of Wednesday or I'll have to pick another winner. Today I’m excited to interview Jenna, a 12th grader who is also an aspiring author for my ASK THE EXPERT series. Jenna is also getting back into blogging and you can check out her awesome blog here. Right. I’m not so great at introductions, but here goes. I’m a senior in high school, a complete superhero freak (Marvel trumps DC), and a Whovian.) My school’s tiny—sixty people in my grade—and I typically like to read about anything impossible. Fantasy, sci-fi, supernatural, superhuman…I’m open to all sorts of stuff. At the end of the day, though, it comes down to character, not genre. I’d follow a grey, likeable character anywhere. 2. You like a lot of the same genres as me. And you're right, the stories have to be about great characters. I know you’re an aspiring author too. Tell us a little bit about what you’re working on and how you juggle writing with a busy high school schedule of homework and other activities. As for finding the balance between life and writing, my method of juggling is more like seesawing. I sort of ride the wave when I have free time, get as much done as I can when I can. And when things are crazy and I can only eek out 100 words a day, I take that too. I could be better about it, but I think finding your own balance is a learning process. You find out what works for you as you go. 3. Congrats on getting to the querying stage soon. It's quite an accomplishment finishing a story while in school. And if it makes you feel any better, it's taken me about 10 years to get my manuscript ready to start querying. Before you started writing, how did you find out about the books you read? What about new books coming out? I didn’t stumble upon the blogosphere until a couple years after I started taking writing seriously. And before that, I really just read whatever I could find at my school library. Since a small town equals a small library, there were never a ton of options, so I wasn’t too picky about what I read. Sometimes friends would suggest books from the outside world, or if I was really impressed by a book, I’d investigate its author’s other stuff. I really only found out about new books coming out if I followed that series or author online. Which makes me sound like a total hermit, but whatever. 4. I grew up in a small town too and didn't have that many choices either. Like you, I read whatever I could get my hands on. How has writing changed what you read, if at all? What books are you waiting to be released? Before I started writing and discovered the blessing/curse that is Netflix, reading was the main way I spent my time. I didn’t do much else. So even if I wasn’t a huge fan of the writing or characters or plot of a certain book, I would almost always finish it anyway. Now that I’m writing, I have a better idea of what I do and don’t like—and with less time for reading, I’m a tiny bit more selective in what I do read. As for my to-read list, I’m not waiting for a ton of specific books—just some that seemed interesting when I read about on other blogs, or sequels to stories I already like. 5. Do you buy most of your book or get them at the library? How often do you go to a bookstore? As a rule, I only buy books I’ve already read and really liked. If I know that’s a book I’ll want to reread, I’ll buy it. Possibly Dave Ramsey’s warped my brain, but it’s also because I’ve been disappointed every time I’ve bought a book without reading it, just based on the back cover or recommendations. And since I live 45 minutes away from the nearest bookstore and don’t drive, I don’t get to visit them often. Sad stuff. 6. That's interesting that you wait to read a book before buying it. That must be hard living so far from a bookstore. Do you read any teen book blogs, author blogs, or author or publisher websites? Become a fan of an author on Facebook? Why? Has this changed at all since you started writing? I do follow authors’ blogs, but most of the time that’s as a writer. As a reader, I keep up with authors’ blogs either because they’re entertaining or because they keep me updated with books and series I love. One of my favorites belongs to Scott Westerfeld; the blog oozes personality, fosters a sense of community among his readers, and has Fan Art Fridays. I also follow Catherine Fisher’s website, mostly because of her Q&A page. She publishes each question that’s submitted to her, plus her answer, all in one place. And most of the questions have to do with her books—story world questions that were never explored in the series, or what color she imagined a character’s eyes being—so it’s interesting to go through. Because her answers provide new information about series that are often already over, it’s like getting to see a small, behind-the-scenes extension of the books. 7. I'm a fan of Catherine Fischer. I'll have to check out her website. Thanks for the tip. Have any of your teachers recommended any blogs or websites to your class or to you? Afraid not. My Shakespeare teacher started a blog this year for her English classes, though, so there’s hope for future generations. 8. I'm not surprised. Not many teens I interview say their teachers recommend blogs or websites.. Are there things your favorite authors could do that would make you more likely to visit their website, their blog, or become a fan on Facebook? See what I mentioned about Westerfeld’s and Fisher’s blogs, and do as they do. 9. Have any authors visited your school? Who? Is there anything you’d recommend that an author do to make their presentation more interesting to you and other kids at your school? My school doesn’t actually get many visitors—mostly just a guy every year with an anti-drug slideshow. Which is great and all, but becomes a little less interesting each time you hear it. Considering that, I’m sure any authors would be welcome to make an appearance at my school. I’d think a behind-the-scenes view of the writing process might be interesting to all the students as a whole. Thanks Jenna for sharing all your great advice. Good luck with the querying! 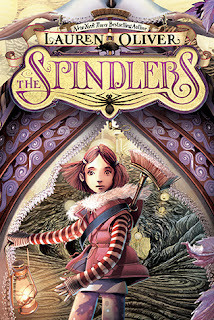 I've also got a great book, THE SPINDLERS, to share with you today. I'm a huge fan of Lauren Oliver and was so excited when I was able to get an ARC of her most recent book. One of the things I loved was the fantastic world building when Liza goes Below. Everywhere Liza journeys, we’re introduced to fantastically creative creatures like the lumer-lumpers, who are the keepers of the light and similar to glow worms, troglods, who are rock shaped creatures, and my favorite, the nocturna, small creatures that fly and are the keepers of the dreams. Lauren does a fantastic job with the world building and shows the depth of her imagination in creating this world. Liza is a character kids will sympathize with. As soon as she knows something is wrong with her brother Patrick, she tries to tell her parents. But her parents are distracted by their own problems of mounting bills and her dad losing his glasses. So they don’t listen to her and when they do, just think she’s making up the problem. I’m sure many kids can relate to that experience. So Liza sets off to find Patrick’s soul Below. She’s not a perfect character. In fact, she’s not very nice to Mirabella, the rat helping her on her journey to the Spindlers’ lair. But in some ways, it makes her more endearing, because all great characters need to grow. And she has a one pointed dedication to trying to save her brother no matter what dangers she faces. She’s loyal and smart and I couldn’t help really liking her. Mirabella is an odd sewer rat, who likes to wear a weird wig, too much make-up, and pieced together clothes. She can be annoying at times. But even in the face of danger and when Liza doesn’t treat her the best, she sticks by Liza. And she has her own lessons to learn. That’s all I’ll say about her because I don’t want to spoil it for you. I’m not usually a fan of books with talking animals, but THE SPINDLERS, like GREGOR THE OVERLANDER by Suzanne Collins, and NIGHTSHADE CITY by Hilary Wagner, are exceptions to the rule. This is a quick read into an amazing fantasy world that middle grade kids—boys and girls—and middle grade adult lovers will really enjoy. Harper Collins generously provided me with an ARC of THE SPINDLERS and then I got a book in the mail too. So I'm giving away both. To enter, all you need to do is be a follower (just click the follow button if you’re not a follower) and leave a comment on Jenna's interview by midnight on November 17th. I’ll announce the winner on November 20th. If your e-mail is not on Blogger, please list it in your comment. On Wednesday I'll be participating in a blog tour for debut author Lea Nolan and giving away a copy of her new book CONJURE. The awesome Elana Johnson is organizing her blog tour and I was excited when she asked me to be part of it. Lea's book is about hidden pirate bounty and unleashing a Gullah curse and sounds fantastic. On Friday I'm hosting debut author Chris Howard and giving away a copy of his book ROOTLESS, a dystopian world about a world about trees. Doesn't it sound like a unique dystopian story? What a cool interview! And THE SPINDLERS sounds awesome! You sound like such a level-headed girl Jenna! I especially liked your discription of how you juggle writing and other responsabilities. And I think reading books before you buy them is a great way to support your local library and know what you're investing in before hand. I hardly ever buy books in an actual bookshop- mostly because I live in France and all the books are in french and I much prefer reading things in my native language. SO I end up buying alot of books through kindle and then buying their more expensive counter-parts in paperback if I really loved them. It was the title and the cover that attracted my attention first and then I read the blurb and loved the story! I hope I'll get the chance to read your book because it sounds wonderful and just what I love reading! You are one smart person! I grew up in a small town and may be headed to a small town again soon. No bookstore there either. And unfortunately the library isn't great either, so that's not fun! Great interview and also thanks for the offer of the giveaway. The Spindlers looks wonderful. oooh, superhero fiction! that sounds fun!! I like how you purchase books, Jenna...much easier on the budget! Good luck with your writing and thanks for the interviews! I tweeted the post. Thanks for the chance to win a copy of SPINDLERS, Natalie! I just read Liesl and Po so I'm really interested in reading this. Nice to meet you too, Jenna! Congrats to Jenna for having a novel almost ready to query. You are not alone with your frustration for how long it takes, and give yourself a pat on the back for revising and taking the time to make the story the best it can be. I'm also like you in that I often buy a book after I have read it from the library - it sounds backwards, but those are the books that are real keepers. Natalie - thanks for interviewing Jenna, and please enter me in The Spindlers giveaway - Lauren Oliver is a favorite at my house! Hi, Jenna! Nice to meet you. Best of luck to you! Jenna, wow! Congrats on having finished a novel of your own. That's quite something at your age. Like you, I only purchase books that I've read previously -- and loved. If a book is going to live in my house, I have to love it and want to re-read it. Natalie, The Spindlers is a fun read! Don't enter me in the giveaway because I've already read it. What a lovely cover! I love Lauren Oliver's versatility. Just a guy with an anti-drug slideshow - funny! She's a superhero and NetFlix geek? Awesome! Interesting interview, Natalie and Jenna. So many teens say the same thing about blogs. So apparently we all need to start studying Scott Westerfeld's blog (which I've had in my blogroll forever)and Catherine Fisher's (which I don't). Please give THE SPINDLERS to someone else. I already have a copy! I really adore Lauren Oliver's writing style. Her characters really stick with me. I'm so eager to read another MG novel from her. It sounds fantastic! I just loved Liesl & Po. It's great to see another teenager take writing and publishing seriously. I came on here agent hunting and got totally distracted. What a cool interview and that book sounds fab! I've bought too many books this year, I think I'll have to do what Jenna does next year, but you can't always get your friend's books through the library. What a cool kid. Characters definitely rule! The SPINDLERS sounds like my kind of a book. I so badly want to read it. I've fallen in love with Lauren's writing since I read Liesl and Po. I can't wait to read this one. Thank you for such a generous giveaway. Hi Jenna-- awesome interview. And good luck with your superhero novel! Great stuff! Congrats to the winners and great interview. I checked out those author websites you mentioned and enjoyed looking through them. Great interview, Jenna. I think it's impressive that you already know how important character development is in your writing. Great to meet you, Jenna. Good luck with your writing. I loved Before I Fall by Lauren Oliver. I want to read this one too! Love reading about teens who read and write--so inspiring. Congrats to Jenna. Wonderful interview as always Natalie! This book sounds like a ton of fun! I am always "selling" books to my students but hadn't thought to recommend author's blog to them. I'll definitely start doing that. Thanks for the tip, Jenna! The Spindlers! <3 Thank you for the opportunity to win! Wonderful interview! It's always great to see young authors in the making!